About us Featured pages Happening soon Photo Galleries Foundation Presidential Handover 2016 - 17 Mary has a ball! The Beetle takes shape Training Page Rotary 2 - "Flexible Rotary" Youth Speaks update Fund Raising Bill’s Big 542 in 2016 Challenge for Cancer Research UK President Mary hand over the cash and her chain! 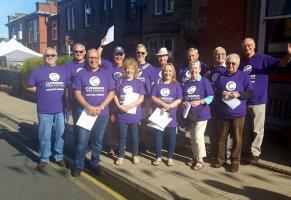 Blood Pressure Awareness Day 2018 Last Night of the Proms Clitheroe Community Bonfire 2018 Young Chef 2019 Club Council District Council Meeting Purple4Polio World Polio Day 2017 Update from Flexible Rotary Clitheroe Food Festival 2018 IT4Africa Three new Paul Harris Fellows Club Service Cliderhow - The Club's Weekly Bulletin District Council Meeting Club Newsletter Two New PHF's Flexible Rotary - report of meeting on 29 May Rotary Bowling at Waddington Club. Booths Supermarket Collection 2018 Smalls for All - Pants to Poverty! Membership & Membership Development Bonfire Committee District Council Meeting Around the Schools with the Purple4Polio exhibit. Young Musician 2017 President Frank's Valedictory Meeting Rotary Golf Cheque Presentation 2018 Purple4Polio comes to Brungerley Park! Technology Tournament 2019 Youth Service Sports Pounds for Polio Purple4Polio at Clitheroe Market! New Year PHF's Rotary Golf Day 2018 More Community Service in Clitheroe Bonfire cash distributed. Thank you Julie! Community Service National Rotary Day/Thanks for Life Purple4Polio the results! 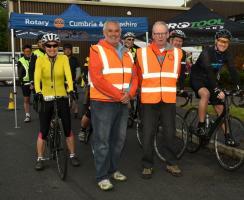 Rotary 2 Video links New Year's day @ Clitheroe Rotary 85th. 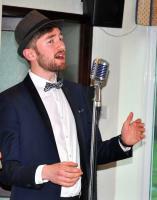 Clitheroe Rotary Birthday Party! IT Schools Africa Update...... Rotary at Work in the Ribble Valley International Purple4Polio Rotary Grand Tour Castle Bandstand get a Rotary makeover Fifty Years a Rotarian! 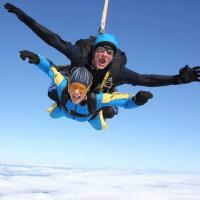 Skydiving challenge.... Life Education Spring Clean.... Rotary Fellowship Exchange 2016 Litter pick Life Education at Christmas! Welcome to Clitheroe Rotary Rotarians and non Rotarians alike. We hope you find something of interest on our web pages. If you would like to find out more, please contact us. What are you doing may 5th? 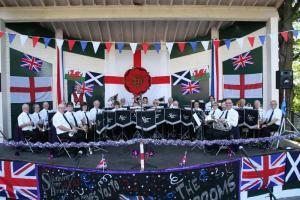 Great turn out at Last Night at the Proms with Slaidburn Silver Band. 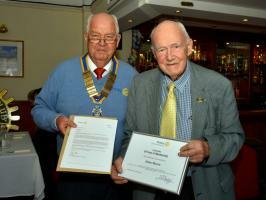 John Myers receives his 50 years certificate. Despite being one of the biggest Rotary Clubs in the North West of England, Sandy says that as President he will maintain a strong recruitment drive (successfully pursued for several years by many Rotarians & more recently by Bill Honeywell) to encourage younger community spirited members in Ribble Valley to join Clitheroe Rotary. For this to succeed the club will need to become more flexible in many ways and capture the enthusiasm of our newer younger members for less formal meetings and flexibility on location & habits. Time will tell if these efforts will achieve the desired results. Apart from the recruitment drive Clitheroe Rotary will maintain its strong support through Rotary International for the global Eradication of Polio. 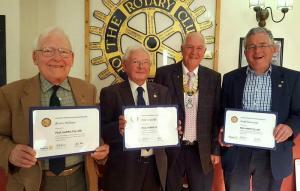 In addition we hope to undertake more projects to help our local community in Clitheroe and the Ribble Valley & we will also continue our efforts to raise funds for a host of smaller local charities similar to the ones which have today received from outgoing President Frank Brown on behave of the Rotarians in the Club. The club has also historically been a strong supporter of Emergency Funding to global and regional disasters (including helping Whalley in Dec 2015 and thereafter through the Flood Action Group), a self-help Project in Africa called Mary’s Meals, and projects under taken in places like Nepal by sister clubs in the Rotary District. Sandy will continue to support the Club with this work but also support a new activity called “little sun” which since 2012 has focussed on small cheap solar self-charging lights to allow many activities but specifically targeted at children’s learning during darkness in rural Africa. For every “little sun” we in the UK purchase at +/- £25 for caravans, camping, etc the “little sun” charity will donate a similar lamp to Africa. On a personal level, Sandy’s chosen charity for his year is Calvert Trust at Keswick who organise outdoor venture-style activities for physically and mentally restricted teenagers and young adults. So like all his predecessors over the years, Sandy is determined to lead the Clitheroe Rotary Club to continue p doing the many Rotary activities to help Individuals and Communities - thus maintaining the traditions of the Club of transforming lives, making a difference and being a non-political inspiration to our community. All Examples of the Rotary ethos over the last 84 years of “Service above Self” in the Ribble Valley & Clitheroe Area. 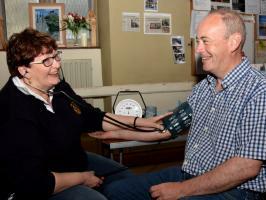 If anyone has a good idea or a needy organisation please feel free to contact Clitheroe Rotary Club. Rotarian David Wymer was also installed as President-Elect during the lunch activities.